From 9 to 16 September 2018, the Tokyo 2020 Olympic Sailing Competition venue in Enoshima, Japan, is hosting sailors for the first event of the 2019 World Cup Series. On Saturday September 15th local Rio silver medallist Olympians Jason Waterhouse and Lisa Darmanin secured gold in the Nacra fleet - a great comeback after injury thwarted their Denmark campaign in August. Five of ten podiums were completed on Saturday September 15th after the first day of Medal Races at the World Cup Series event in Enoshima, Japan. Enoshima and Sagami Bay received extensive rainfall overnight but as a breeze began to develop, there was nothing that could dampen the competitors' spirits, with five Medal Races on the cards and a continuation of fleet racing elsewhere. In a somewhat steady 6-8 knot north-easterly breeze, five gold medallists were confirmed on the water. Nacra 17 gold went to Jason Waterhouse and Lisa Darmanin (AUS), with Kiran Badloe (NED) and Peina Chen (CHN) taking the honours in the Men's and Women's RS:X.
Martine Grael and Kahena Kunze (BRA) had confirmed gold the day prior in the 49erFX, while James Peters and Fynn Sterritt (GBR) conquered in the 49er. Fleet racing continued in the Laser, Laser Radial, Finn, Men's 470 and Women's 470. Elliot Hanson (GBR) has an unassailable lead in the Laser to seal gold with a race remaining. Waterhouse and Lisa ended Ruggero Tita and Caterina Banti's (ITA) winning streak in the Nacra 17 after an intriguing Medal Race - which was not without controversy before the start gun even sounded. Ahead of the race, Nathan and Haylee Outteridge (AUS) protested the two Italian boats under class rule C.8.1(a), which is all related to foil maintenance. The Jury found that, "the outermost surfaces of the daggerboards of ITA 26 and ITA 5 were sanded" but they concluded that "the essential shape, characteristics and function of the original component were not affected," therefore the Italian boats did not break a class rule. Speaking after racing, Waterhouse said, "We feel they do things outside of what you should, but at the end of the day it's up to the jury. As long as we know we can do the same thing, we're happy to chase in that way." The two Australian and Italian teams fought hard from the off and a clean start enabled all of the medal contenders to hit the front of the fleet. Tactical duels unfolded as Tita and Banti initially did enough to hold on to gold. However, a lapse of concentration cost them dearly. "On the first downwind we gybed a bit short to the layline and we had to gybe again," explained Tita. "The other teams had more pressure and they were able to round the mark and that cost us a lot." "We had a game plan before the start," said Waterhouse. "We knew the left was going to be very strong, so we wanted to lead that way off the pin end. It was tight. We had to do a lot of tactical battling to keep the Italians off behind us. Lisa did a great job by keeping us in the right spot and I made the right tactical decisions." Darmanin added, "The Italians have definitely had an edge over the last year and we've been chasing to be better everyday. They showed at the beginning of the week that they're quick and we know we have to go home and work hard to be just as quick or quicker. To have two Italians on the podium goes to show they're doing well but Nathan and Haylee were fourth. The Aussie squad is chasing them." 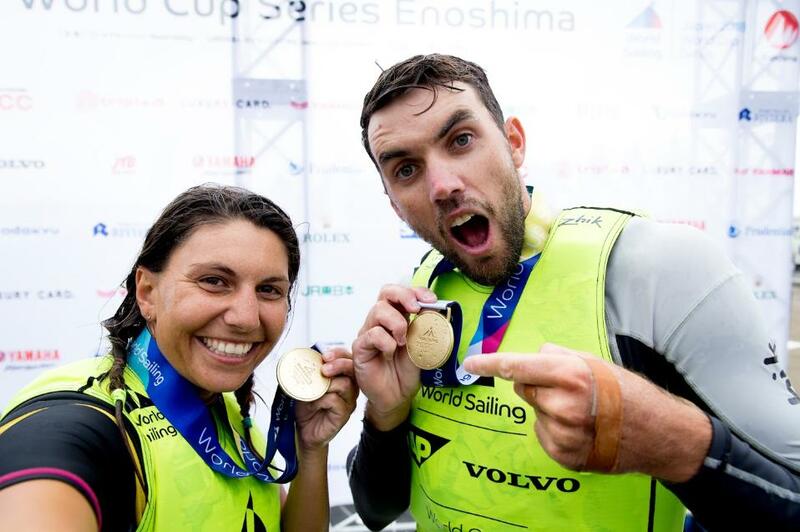 Relive today's awesome effort by Jason Waterhouse & Lisa Darmanin to win the Gold Medal here in Enoshima. We also caught up with rising stars, Tash Bryant & Annie Wilmot in the 49erFX.